Helicobacter pylori eradication in complicated peptic ulcer: Beneficial in most? Helicobacter pylori eradication therapy has a role in minimizing the complications of peptic ulcer disease, namely, bleeding, perforation, and obstruction. However, the precise role of H. pylori eradication therapy in the complicated ulcers remains inconclusive, especially in perforation and gastric outlet obstruction. The prevalence of H. pylori in peptic ulcer bleeding patients has been widely underestimated owing to the differences in diagnostic tests and patient characteristics, and hence, it is recommended that an initial negative test should be followed up by a delayed repeat testing to rule out false negativity. It is well established now that eradication of H. pylori in patients with bleeding ulcers reduces rebleeding and ulcer recurrence. Multiple studies have attributed high recurrence rates of duodenal ulcer following simple closure to a high prevalence of H. pylori infection. Eradication therapy decreases the recurrence rate of perforated ulcers, thus justifying the role of H. pylori eradication therapy following the primary surgical management of perforated ulcers. The role of H. pylori in duodenal ulcer with gastric outlet obstruction is yet to be evaluated clearly. There are some reports of resolution of gastric outlet obstruction following therapy for H. pylori, obviating the need for surgery. Clarithromycin-containing regimens are recommended as first-line in areas of low resistance, whereas bismuth-containing quadruple therapy is the first-line empirical treatment in areas of high clarithromycin resistance. Treatment of H. pylori is beneficial in most of the patients with complicated peptic ulcer disease, especially in reducing recurrence of ulcer with or without complications. Ever since Marshall and Warren identified Helicobacter pylori as the causative agent for gastritis and peptic ulcer disease in 1983, it has been a subject of intense research and has been proven to be associated with a multitude of gastrointestinal and nongastrointestinal problems.H. pylori is a ubiquitous microaerophilic microbe found in almost 50% of the global population. The correlation of peptic ulcer disease with H. pylori infection has been established over the last few decades and studies have documented that 90% of duodenal ulcers and up to 70% of gastric ulcers have concurrent H. pylori infection.,H. pylori- associated peptic ulcer disease has shown a declining trend in the developed countries; however, data from the developing countries are insufficient to support the same., Untreated peptic ulcer disease is known to progress into complications in 20%–25% of the patients. Despite the new treatment regimens introduced, we have conflicting reports in literature about the incidence of complications of peptic ulcer disease, especially bleeding and perforation. Today's treatments include long-term cure with a short course of treatment. Nevertheless, the adaptation of the organism to various therapies leading to resistance necessitates an ever changing need to adapt the therapy accordingly. In this review, we will discuss the role of H. pylori therapy in complicated peptic ulcer with special reference to the regimens for eradication of H. pylori. Peptic ulcer bleeding is the most common complication affecting about 70% cases and has become the important cause of morbidity and mortality in peptic ulcer disease patients., Peptic ulcer bleeding is the most common complication of peptic ulcer disease in the West; however, in South Asian countries such as India, perforated ulcers remains the most common complication. H. pylori infection and nonsteroidal anti-inflammatory drugs (NSAIDs) use are considered as two independent risk factors for upper gastrointestinal bleeding (UGIB). Numerous studies have reported a decline in recurrent bleeding episodes following H. pylori eradication therapy. However, there are reports that have estimated a lower prevalence of H. pylori in complicated ulcers in comparison to uncomplicated cases. Acute peptic ulcer bleeding patients are usually found to test negative for H. pylori infection. A systematic review of the various diagnostic tests in use has reported that 30%–50% of peptic ulcer bleed patients had false negative results for H. pylori testing. This low prevalence may be attributed to the diagnostic method used and to the patient population being studied. As there is a possibility of wide underestimation of its prevalence in patients with bleeding ulcers, it is recommended that the initial negative test should be followed up by a delayed repeat testing. In patients with UGIB, one of the difficulties encountered is the diagnosis of H. pylori infection in the presence of fresh or altered blood in the stomach. The sensitivities of rapid urease test (RUT), histology, and stool antigen test have been documented to be reduced in the presence of blood in the stomach. We have reported a significantly decreased sensitivity of rapid urease, histology, and combination of both in the presence of blood in stomach. The various mechanisms suggested for the negative results on RUT in bleeding patients are bactericidal effect of the serum, anti-H. pylori antibodies which inhibit urease production, decreased urease activity due to various serum enzymes, and simultaneous administrations of NSAIDs or proton-pump inhibitor (PPI). Similar results about the sensitivity of RUT have been reported in studies from Hong Kong, Greece, and Taiwan.,, Hence, it should be emphasized that negative results of these tests are interpreted with caution. Another consideration is that the antral bacterial density might be low in bleeding peptic ulcer, hence taking multiple biopsies from antrum and body has been found to increase the positivity of the RUT. Most authors agree that a RUT cannot be the only test done in acute setup, and a negative RUT in the acute stage is an indication for a repeat test 4–8 weeks later as this has been found to yield an 80% positivity in previously negative patients. Histology has been found to have equal or lesser sensitivity than RUT according to various studies. The positivity is highly dependent on the site of biopsy and the bacterial load as previously described. Hence, histology should be interpreted along with other tests. Culture and polymerase chain reaction (PCR) are time-consuming and there are conflicting reports of the sensitivity of PCR in literature. However, most authors agree that a modified real-time PCR could improve the diagnostic accuracy in UGIB patients. The sensitivity of stool antigen test also decreases in the presence of blood. However, urea breath test (UBT) has been shown to be unaffected by the blood in the stomach and has a high accuracy and positive likelihood ratio in UGIB patients, and hence, requires no further confirmation., The only objection making it necessary to delay the test is the requirement to take urea containing solution orally, in a bleeding patient. Serology has been shown to be more sensitive than all other invasive tests by a study done in Taiwan, in bleeding patients. However, caution should be exercised when interpreting the results, especially in patients who have been previously treated for H. pylori infection as the antibodies have been demonstrated to last for up to a year. There are reports of higher prevalence in bleeding ulcers being detected on performing delayed tests and in studies involving younger population. There is a consensus in literature that as none of the diagnostic modalities available have good diagnostic performance in the setting of bleeding, it is recommended that a combination of modalities be utilized rather than relying on any one of the tests as a first-line of investigation. It is also recommended to follow-up the negative tests with delayed repeated tests. A recent study from Taiwan has emphasized on the timing of eradication therapy and has recommended administration of anti-H. pylori therapy within 120 days in cases of bleeding ulcers so as to minimize further complications. The relationship between H. pylori and bleeding ulcers and its influence on rebleeding rates has been elucidated in detail. It has been estimated that there is 10%–14% risk of hemorrhage on 5-year follow-up in untreated duodenal ulcer patients, the risk being further higher if the patient has already had an episode of UGIB. A prospective study done in our center has reported the prevalence of H. pylori in bleeding duodenal ulcer to be comparable with that of noncomplicated duodenal ulcers. Evidence supports H. pylori as an independent predictor of bleeding duodenal ulcer recurrence., There are meta-analysis studies that have established H. pylori eradication therapy as more effective than noneradication therapy in preventing recurrent bleeding ulcers. H. pylori infection and NSAIDs use have been found to be independent risk factors for bleeding peptic ulcers. Patients who are on long-term NSAID use continue to present with bleeding peptic ulcers despite H. pylori eradication. Hawkey conducted a prospective, controlled study and found that in patients with bleeding ulcers, H. pylori-positive NSAID users were at more risk for bleed than H. pylori-negative users. The declining prevalence of H. pylori could have reduced the effect of increased NSAID intake. Similarly, patients requiring long-term NSAID use should be tested for H. pylori in advance as H. pylori eradication has been shown to decrease the incidence of peptic ulcer bleeding. Since the discovery of H. pylori in the mid-eighties, even though the etiologies of bleeding peptic ulcer are changing, diagnosis of H. pylori remains the priority. RUT is the most commonly used. If it is negative, combination of other invasive and noninvasive tests should be done. Eradication of H. pylori can reduce the rebleeding risk, and is recommended to be started as soon as possible. 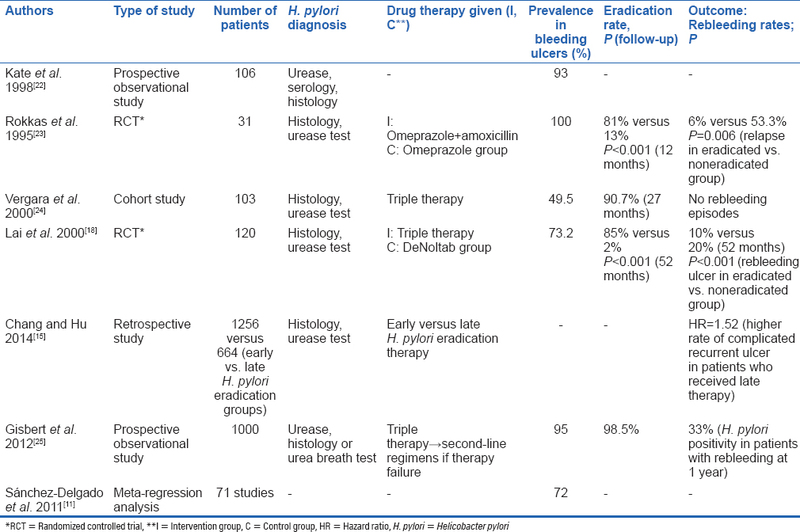 The association of H. pylori and the role of eradication therapy in preventing rebleeding episodes is summarized in [Table 1]. H. pylori eradication is also useful in patients who are on concomitant treatment with NSAIDs, aspirin, or other antiplatelet drugs. Perforation occurs in 2%–10% of peptic ulcer disease and accounts for 70% of peptic ulcer disease associated deaths. Till date, the preferred treatment for perforated ulcers remains the primary closure. However, it is associated with an unacceptable ulcer recurrence rate of 42%–50%. Combining definitive surgery with the emergency procedure reduces ulcer recurrence but may be associated with long-term side effects in patients who would have been cured with primary closure alone. The lack of a reliable method to identify patients prone for relapse emphasizes the need for alternative approaches for reducing ulcer recurrence. Although H. pylori is a well-established cause for peptic ulcer disease, studies investigating the association between H. pylori and perforated ulcers are few and divergent. There are reports suggesting a varied prevalence of H. pylori from 0% to 92% in patients with perforated ulcers.,,, Multiple studies have attributed high recurrence rates of duodenal ulcer following simple closure to a high prevalence of H. pylori infection. Ng et al. in a study on 104 patients treated with patch closure of perforated peptic ulcer, reported no disease recurrence in 95% of the patients who received postoperative anti-H. pylori therapy. However, there are reports which negate an association of H. pylori with perforated ulcers., The discrepancy between infection rates in the literature, however, may be due to differences in the study populations., For instance, an infection rate of 83% was found in an Indian study done on young male smokers who had acute perforated ulcer whereas another small study on Indian population showed all patients of perforated peptic ulcer disease negative for H. pylori. The divergence in the association between perforated peptic ulcer and H. pylori may also be attributed to the lack of uniformity in choosing the biopsy sites. In the latter study from North India, intraoperative biopsies were taken from the site of perforation for diagnosis. We have always preferred to do biopsy on elective basis at 3 months postsurgery period so that the suppressive effect of postoperative antibiotics does not affect H. pylori detection., When the biopsies are carried out during elective endoscopy, the sites for taking biopsy are precisely identified and there is no discrepancy in carrying out the endoscopic test. The role of NSAIDs use as an independent risk factor for ulcer recurrence has also been debated and might act as a confounder in studies evaluating the role of H. pylori. Studies from the West have shown that chronic NSAIDs use can lead to peptic ulcer perforation which is independent of H. pylori infection, as in many of these populations, the overall prevalence of H. pylori is low. A study from Switzerland reported an association between H. pylori and acute perforated ulcer regardless of chronic NSAIDs use. There is also evidence that proposes a specific genotype of H. pylori as the causative factor for peptic ulcer perforation. Hence, the substantial genetic heterogeneity might be the reason for prevalence of H. pylori being similar in patients with perforation and controls in various studies. An earlier study reported from our center found a prevalence of H. pylori in perforated duodenal ulcer comparable with that of the controls, but the H. pylori infection rate in patients who had recurrence on follow-up was significantly higher. We could demonstrate an association between H. pylori and recurrent ulcer in short, intermediate, and long-term. The study, however, failed to clarify the precise role of H. pylori eradication in preventing ulcer recurrence, probably owing to the metronidazole resistance in the population. In a study that followed, we used a quadruple regimen (excluding metronidazole) with a probiotic and had reported that in the eradicated group ulcer recurrence was 18.6% as compared to 70% in the noneradicated group. There is strong-documented evidence in literature supporting the role of H. pylori eradication in duodenal ulcer following the initial surgical management. It has also been established over the past few years that H. pylori eradication therapy decreases the recurrence rate of perforated ulcers. This data have been summarized in [Table 2]. Hence, anti-H. pylori therapy should be recommended for all H. pylori positive perforated peptic ulcer disease patients. The third most common complication following peptic ulcer disease is obstruction. Literature is diverse about the association between H. pylori and gastric outlet obstruction. The prevalence rate of H. pylori in gastric outlet obstruction varies between 33% and 90%. The wide range in the prevalence may be due to the number of diagnostic tests used, namely, only staining versus staining and RUT/histology, NSAIDs intake and the number of biopsies taken. Negative test results may also be due to the inability of H. pylori to survive in the obstructed stomach. Long-standing ulcer with recurrent episodes of ulceration and healing can cause cicatricial stenosis of the pyloric lumen as well as cause alteration in the intragastric milieu. We had reported a high prevalence of H. pylori infection in duodenal ulcer with gastric outlet obstruction even in the absence of an active ulcer. A study from our center also concluded that the curative role of truncal vagotomy is independent of H. pylori status. Endoscopic evaluation of gastric outlet obstruction may be misleading and symptomatic relief should always be a goal in these patients. Sometimes patients may have stenosis of the pylorus on endoscopy; however, they might be totally asymptomatic. In most of the obstructed patients, the cause of outlet obstruction is often due to edema and spasm of the duodenum rather than cicatrization of the duodenum due to long-standing ulcer disease. The proponents of anti-H. pylori therapy for gastric outlet obstruction suggest that active ulceration associated with H. pylori infection leads to obstruction primarily due to inflammation and edema rather than fibrosis, and hence, H. pylori therapy permits resolution of the obstruction. However, in cases of complete fibrosis leading to gastric outlet obstruction, surgical intervention offers the best form of relief. There are few isolated reports of resolution of gastric outlet obstruction following therapy for H. pylori, obviating the need for surgery. The role of H. pylori in duodenal ulcer with gastric outlet obstruction is yet to be evaluated clearly; however, eradication is indicated as a primary intervention in literature. The summary of available literature on the role of H. pylori in gastric outlet obstruction is described in [Table 3]. Again, we reemphasize that if the obstruction is due to fibrosis without any evidence of spasm or edema, then surgery offers the best form of relief, especially in countries where patients have access to off-the-counter antisecretory drugs and the diagnosis of duodenal ulcer is delayed resulting in a chronic duodenal ulcer with gastric outlet obstruction. It is well established now that the eradication of H. pylori in patients with bleeding and perforated ulcers reduces chances of ulcer recurrence as well as the complications. The present treatment guidelines recommend the PPI-based triple therapy as the first-line of treatment, which includes, a PPI with amoxicillin and either clarithromycin or metronidazole for 1 week., However, a bismuth-based quadruple regimen is the recommended first-line treatment in areas of known clarithromycin resistance, which includes a PPI, bismuth subsalicylate, metronidazole, and tetracycline for 7–14 days., The eradication rates in all the traditional regimens are similar and are only partly successful. However, there is a wide consensus that in a H. pylori-positive duodenal or gastric ulcer, eradication therapy is effective in preventing recurrence when compared to just PPIs or no treatment. The standard triple therapy (STT) with PPI, clarithromycin, and amoxicillin thus remains the recommended choice when patient has not received clarithromycin previously. In cases of penicillin allergy, metronidazole is the recommended substitute for amoxicillin. Bismuth quadruple therapy is the preferred alternative in these patients who have been treated with clarithromycin or are allergic to penicillin. However, as bismuth is not widely available and can be a limitation. The STT regimen proposed at the first Maastricht conference is being widely used with an eradication rate of 71%–82.8%. However, there is a shift in preference to sequential therapy (ST) in the West as recent evidence suggests ST to be superior to conventional STT in terms of H. pylori eradication.,,, ST has been shown to be superior in the management of clarithromycin resistance. ST includes giving a PPI with amoxicillin for 5 days followed by triple therapy with PPI, tinidazole, and clarithromycin for the next 5 days. Evidence shows encouraging reports of higher rates of eradication as compared to any of the other present regimens. A study by Liou et al. compared the eradication rates of ST with the STT and showed eradication rates of 87% and 82.3%, respectively. This trial also demonstrated an eradication rate of around 90.7% with extended ST for 14 days. A systematic review by Vaira et al. of 22 randomized controlled trials (RCTs) on 2380 patients showed an eradication rate of 91.3% with ST. Jafri et al. in a meta-analysis of 10 RCTs including 2747 patients demonstrated ST to be superior to STT (eradication rates: 93.4% vs. 76.9%). Although there is evidence supporting ST over 7- or 10-day STT, the eradication rates were similar between ST and an extended 14-day STT., The compliance rates and side effect profiles too were similar; however, ST was cheaper, and hence, the economical alternative to STT. Another modification of ST is the concomitant therapy (CT) where all the four drugs are given together. CT was reported to have an eradication rate as high as 90% in a few reports., The efficacy was found to be similar in another study. Another study from our center also reported similar results where ST and CT were comparable in terms of eradication rate, cost, recurrence, and compliance to treatment. Even though ST appears to be highly efficient in eradication, there are still some patients who fail to respond. Hence, a second-line treatment was developed for this group of people, called salvage therapy which included a PPI, with amoxicillin and levofloxacin for a total of 10 days. A pilot study carried out by Zullo et al. concluded that this treatment was successful as an alternative in the event of failure of ST in 85.7% of cases. The American College of Gastroenterologists suggests that the salvage therapy is successful in three-fourth of the cases when implemented after a failed ST. The available clinical trials on salvage therapy are, however, limited by a small number of patients and have demonstrated a varied eradication rates ranging from 63% to 94%.,, A recent meta-analysis demonstrated a levofloxacin-based triple therapy for 10 days to be superior in H. pylori eradication (87% vs. 68%) and with relatively lesser side effects when compared with a bismuth-based quadruple therapy for 7 days. Another report from Italy demonstrated an eradication rate of 84% using rabeprazole, levofloxacin, and tinidazole replacing amoxicillin. However, levofloxacin resistance in 16.8% of H. pylori strains has been reported from various countries.,,, The resistance pattern, however, is yet to be determined. Hybrid therapy is a novel treatment regimen which has recently shown to achieve better eradication rates when compared to ST, especially in the setting of dual resistance to clarithromycin and metronidazole. The superiority of hybrid therapy may be either due to longer duration of therapy or concurrent administration of antibiotics. Hybrid therapy encompasses PPI with amoxicillin for 7 days followed by PPI, amoxicillin, metronidazole, and clarithromycin for the next 7 days. Recent studies demonstrated an eradication rate of 82%–92.9% with hybrid therapy.,,, A recent RCT from our center on 194 patients demonstrated an eradication rate of 88.3%. Although when compared to ST, eradication rate and compliance were better, ST was found to be more cost-effective than hybrid therapy. A meta-analysis of 1985 patients demonstrated the higher efficacy of hybrid therapy when compared to ST. Although no consensus is achieved as with the case of uncomplicated ulcer disease, there is commendable evidence to support the role of H. pylori eradication in the treatment of complicated peptic ulcer disease.,, Hence, it is mandatory to test all patients with complicated peptic ulcer disease for the presence of H. pylori using combined modality of tests and delayed testing after 4–8 weeks if required in patients with bleeding. This should be followed with anti-H. pylori therapy in positive patients, with either STT or ST or hybrid therapy or quadruple regimens or levofloxacin-based therapy depending on the resistance patterns and community protocols in place. Maastricht IV consensus report recommends eradication therapy in patients of perforated ulcer; however, PPIs in complicated duodenal ulcer are recommended until eradication is confirmed and till complete ulcer healing in case of gastric ulcers. The effectiveness of H. pylori eradication therapy in preventing rebleeding in infected patients has been well established; however, the timing of therapy remains controversial. In patients with peptic ulcer bleeding, empirical anti-H. pylori therapy along with resumption of the oral feeds is the recommended cost-effective strategy for averting recurrent hemorrhage. A high prevalence of H. pylori infection has been demonstrated in the peptic ulcer complications, namely, bleeding perforation and obstruction. There are reports suggesting persistent H. pylori infection as independent predictor of rebleeding risk. However, the empirical therapy for H. pylori is not recommended for all complications of peptic ulcer disease. As the reported prevalence of H. pylori is high in bleeding duodenal ulcers, empirical therapy is often advised following control of the bleeding episode. In patients of perforated ulcers, apart from a prevalence of H. pylori infection of 60%–70%, there is a significant reduction in ulcer recurrence in H. pylori- infected patients who received eradication therapy following surgical management. This underlines the vital role of H. pylori eradication in patients with perforated ulcer disease. However, a “test and treat” strategy is preferred than empirical treatment following perforated duodenal ulcer disease. Although surgical treatment is preferred over endoscopic treatment in patients with gastric outlet obstruction due to peptic ulcers, limited reports of success of endoscopic modalities combined with eradication therapy indicate the importance of anti-H. pylori treatment in these patients. Empirical H. pylori eradication is advisable in patients of gastric outlet obstruction treated by endoscopic methods; however, it does not have a role in patients treated by surgical methods. Among the various treatment regimens available, ST is now becoming popular with eradication rates similar to that of STT. However, the treatment regimens should be judiciously chosen based on the patient compliance and regional resistance pattern. Malfertheiner P, Megraud F, O'Morain CA, Gisbert JP, Kuipers EJ, Axon AT, et al. Management of Helicobacter pylori infection-the Maastricht V/Florence Consensus Report. Gut 2016. pii: Gutjnl-2016-312288. NIH Consensus Conference. Helicobacter pylori in peptic ulcer disease. NIH consensus development panel on Helicobacter pylori in peptic ulcer disease. JAMA 1994;272:65-9. Chen TS, Luo JC, Chang FY. Prevalence of Helicobacter pylori infection in duodenal ulcer and gastro-duodenal ulcer diseases in Taiwan. J Gastroenterol Hepatol 2010;25:919-22. Xia B, Xia HH, Ma CW, Wong KW, Fung FM, Hui CK, et al. Trends in the prevalence of peptic ulcer disease and Helicobacter pylori infection in family physician-referred uninvestigated dyspeptic patients in Hong Kong. Aliment Pharmacol Ther 2005;22:243-9. Mandeville KL, Krabshuis J, Ladep NG, Mulder CJ, Quigley EM, Khan SA. Gastroenterology in developing countries: Issues and advances. World J Gastroenterol 2009;15:2839-54. Huang TC, Lee CL. Diagnosis, treatment, and outcome in patients with bleeding peptic ulcers and Helicobacter pylori infections. Biomed Res Int 2014;2014:658108. Laine L, Peterson WL. Bleeding peptic ulcer. N Engl J Med 1994;331:717-27. Barthel JS. Bleeding ulcers and Helicobacter pylori. Gastrointest Endosc 1997;46:371-3. Henriksson AE, Edman AC, Nilsson I, Bergqvist D, Wadström T. Helicobacter pylori and the relation to other risk factors in patients with acute bleeding peptic ulcer. Scand J Gastroenterol 1998;33:1030-3. Hopkins RJ, Girardi LS, Turney EA. Relationship between Helicobacter pylori eradication and reduced duodenal and gastric ulcer recurrence: A review. Gastroenterology 1996;110:1244-52. Sánchez-Delgado J, Gené E, Suárez D, García-Iglesias P, Brullet E, Gallach M, et al. Has H. pylori prevalence in bleeding peptic ulcer been underestimated? A meta-regression. Am J Gastroenterol 2011;106:398-405. Mittal S, Trakroo S, Kate V, Jagdish S. Evaluation of the effect of presence of blood in the stomach on endoscopic diagnostic tests for Helicobacter pylori infection. Indian J Med Microbiol 2011;29:379-82. Wang YK, Kuo FC, Liu CJ, Wu MC, Shih HY, Wang SS, et al. Diagnosis of Helicobacter pylori infection: Current options and developments. World J Gastroenterol 2015;21:11221-35. Chang SS, Hu HY. Helicobacter pylori eradication within 120 days is associated with decreased complicated recurrent peptic ulcers in peptic ulcer bleeding patients. Gut Liver 2015;9:346-52. Leontiadis GI, Sreedharan A, Dorward S, Barton P, Delaney B, Howden CW, et al. Systematic reviews of the clinical effectiveness and cost-effectiveness of proton pump inhibitors in acute upper gastrointestinal bleeding. Health Technol Assess 2007;11:1-164. Kate V, Ananthakrishnan N, Badrinath S. Effect of Helicobacter pylori eradication on the ulcer recurrence rate after simple closure of perforated duodenal ulcer: Retrospective and prospective randomized controlled studies. Br J Surg 2001;88:1054-8. Lai KC, Hui WM, Wong WM, Wong BC, Hu WH, Ching CK, et al. Treatment of Helicobacter pylori in patients with duodenal ulcer hemorrhage – A long-term randomized, controlled study. Am J Gastroenterol 2000;95:2225-32. Gisbert JP, Khorrami S, Carballo F, Calvet X, Gene E, Dominguez-Muñoz E, et al. Meta-analysis: Helicobacter pylori eradication therapy vs. anti-secretory non-eradication therapy for the prevention of recurrent bleeding from peptic ulcer. Aliment Pharmacol Ther 2004;19:617-29. Manguso F, Riccio E, de Nucci G, Aiezza ML, Amato G, Degl'Innocenti L, et al. Helicobacter pylori infection in bleeding peptic ulcer patients after nonsteroidal anti-inflammatory drug consumption. World J Gastroenterol 2011;17:4509-16. Hawkey CJ. Risk of ulcer bleeding in patients infected with Helicobacter pylori taking non-steroidal anti-inflammatory drugs. Gut 2000;46:310-1. Kate V, Ananthakrishnan N, Badrinath S, Amarnath SK, Ratnakar C. Bleeding duodenal ulcer: Is Helicobacter pylori a risk factor? Indian J Gastroenterol 1998;17:34-5. Rokkas T, Karameris A, Mavrogeorgis A, Rallis E, Giannikos N. Eradication of Helicobacter pylori reduces the possibility of rebleeding in peptic ulcer disease. Gastrointest Endosc 1995;41:1-4. Vergara M, Casellas F, Saperas E, de Torres I, Lopez J, Borruel N, et al. Helicobacter pylori eradication prevents recurrence from peptic ulcer haemorrhage. Eur J Gastroenterol Hepatol 2000;12:733-7. Gisbert JP, Calvet X, Cosme A, Almela P, Feu F, Bory F, et al. Long-term follow-up of 1,000 patients cured of Helicobacter pylori infection following an episode of peptic ulcer bleeding. Am J Gastroenterol 2012;107:1197-204. Bertleff MJ, Lange JF. Perforated peptic ulcer disease: A review of history and treatment. Dig Surg 2010;27:161-9. Ananthakrishnan N, Angami K. Is ulcer recurrence after simple closure of perforated duodenal ulcer predictable? Indian J Gastroenterol 1993;12:80-2. Sevvel S, Ananthakrishnan N, Kate V. Role of histamine-2 receptor antagonists after simple closure of perforated duodenal ulcer-a double blind randomized, controlled study. Trop Gastroenterol 1996;17:227-9. Ng EK, Lam YH, Sung JJ, Yung MY, To KF, Chan AC, et al. Eradication of Helicobacter pylori prevents recurrence of ulcer after simple closure of duodenal ulcer perforation: Randomized controlled trial. Ann Surg 2000;231:153-8. Laine L, Jensen DM. Management of patients with ulcer bleeding. Am J Gastroenterol 2012;107:345-60. Reinbach DH, Cruickshank G, McColl KE. Acute perforated duodenal ulcer is not associated with Helicobacter pylori infection. Gut 1993;34:1344-7. Sharma AK, Mittal S, Malvi SK. Association of Helicobacter pylori with peptic perforation in Chattisgarh region of India. Trop Gastroenterol 2000;21:42-3. Bose AC, Kate V, Ananthakrishnan N, Parija SC. Helicobacter pylori eradication prevents recurrence after simple closure of perforated duodenal ulcer. J Gastroenterol Hepatol 2007;22:345-8. Valooran GJ, Kate V, Jagdish S, Basu D. Sequential therapy versus standard triple drug therapy for eradication of Helicobacter pylori in patients with perforated duodenal ulcer following simple closure. Scand J Gastroenterol 2011;46:1045-50. Sostres C, Gargallo CJ, Lanas A. Interaction between Helicobacter pylori infection, nonsteroidal anti-inflammatory drugs and/or low-dose aspirin use: Old question new insights. World J Gastroenterol 2014;20:9439-50. Metzger J, Styger S, Sieber C, von Flüe M, Vogelbach P, Harder F. Prevalence of Helicobacter pylori infection in peptic ulcer perforations. Swiss Med Wkly 2001;131:99-103. Komen NA, Bertleff MJ, van Doorn LJ, Lange JF, de Graaf PW. Helicobacter genotyping and detection in peroperative lavage fluid in patients with perforated peptic ulcer. J Gastrointest Surg 2008;12:555-60. El-Nakeeb A, Fikry A, Abd El-Hamed TM, Fouda el Y, El Awady S, Youssef T, et al. Effect of Helicobacter pylori eradication on ulcer recurrence after simple closure of perforated duodenal ulcer. Int J Surg 2009;7:126-9. Tomtitchong P, Siribumrungwong B, Vilaichone RK, Kasetsuwan P, Matsukura N, Chaiyakunapruk N. Systematic review and meta-analysis: Helicobacter pylori eradication therapy after simple closure of perforated duodenal ulcer. Helicobacter 2012;17:148-52. Gisbert JP, Pajares JM. Review article: Helicobacter pylori infection and gastric outlet obstruction – Prevalence of the infection and role of antimicrobial treatment. Aliment Pharmacol Ther 2002;16:1203-8. Kate V, Ananthakrishnan N, Badrinath S, Amarnath SK, Ratnakar C. Helicobacter pylori infection in duodenal ulcer with gastric outlet obstruction. Trop Gastroenterol 1998;19:75-7. Jones VS, Ananthakrishnan N, Kate V, Badrinath S. What happens to Helicobacter pylori after vagotomy and drainage? Trop Gastroenterol 1999;20:50-2. Boylan JJ, Gradzka MI. Long-term results of endoscopic balloon dilatation for gastric outlet obstruction. Dig Dis Sci 1999;44:1883-6. Gibson JB, Behrman SW, Fabian TC, Britt LG. Gastric outlet obstruction resulting from peptic ulcer disease requiring surgical intervention is infrequently associated with Helicobacter pylori infection. J Am Coll Surg 2000;191:32-7. Taskin V, Gurer I, Ozyilkan E, Sare M, Hilmioglu F. A meta-analysis of the success rate of Helicobacter pylori therapy in Canada. Can J Gastroenterol 2007;21:295-300. Brandimarte G, Tursi A, di Cesare L, Gasbarrini G. Antimicrobial treatment for peptic stenosis: A prospective study. Eur J Gastroenterol Hepatol 1999;11:731-4. Current European concepts in the management of Helicobacter pylori infection. The Maastricht consensus report. European Helicobacter pylori study group. Gut 1997;41:8-13. Chey WD, Wong BC; Practice Parameters Committee of the American College of Gastroenterology. American College of Gastroenterology guideline on the management of Helicobacter pylori infection. Am J Gastroenterol 2007;102:1808-25. Yoon JH, Baik GH, Kim YS, Suk KT, Shin WG, Kim KH, et al. Comparison of the eradication rate between 1- and 2-week bismuth-containing quadruple rescue therapies for Helicobacter pylori eradication. Gut Liver 2012;6:434-9. Ford AC, Gurusamy KS, Delaney B, Forman D, Moayyedi P. Eradication therapy for peptic ulcer disease in Helicobacter pylori-positive people. Cochrane Database Syst Rev 2016;4:CD003840. Jafri NS, Hornung CA, Howden CW. Meta-analysis: Sequential therapy appears superior to standard therapy for Helicobacter pylori infection in patients naive to treatment. Ann Intern Med 2008;148:923-31. Vaira D, Zullo A, Vakil N, Gatta L, Ricci C, Perna F, et al. Sequential therapy versus standard triple-drug therapy for Helicobacter pylori eradication: A randomized trial. Ann Intern Med 2007;146:556-63. Zullo A, Vaira D, Vakil N, Hassan C, Gatta L, Ricci C, et al. High eradication rates of Helicobacter pylori with a new sequential treatment. Aliment Pharmacol Ther 2003;17:719-26. Hassan C, De Francesco V, Zullo A, Scaccianoce G, Piglionica D, Ierardi E, et al. Sequential treatment for Helicobacter pylori eradication in duodenal ulcer patients: Improving the cost of pharmacotherapy. Aliment Pharmacol Ther 2003;18:641-6. Gatta L, Vakil N, Leandro G, Di Mario F, Vaira D. Sequential therapy or triple therapy for Helicobacter pylori infection: Systematic review and meta-analysis of randomized controlled trials in adults and children. Am J Gastroenterol 2009;104:3069-79. Liou JM, Chen CC, Chen MJ, Chen CC, Chang CY, Fang YJ, et al. Sequential versus triple therapy for the first-line treatment of Helicobacter pylori: A multicentre, open-label, randomised trial. Lancet 2013;381:205-13. Vaira D, Zullo A, Hassan C, Fiorini G, Vakil N. Sequential therapy for Helicobacter pylori eradication: The time is now! Therap Adv Gastroenterol 2009;2:317-22. Graham DY, Fischbach L. Helicobacter pylori treatment in the era of increasing antibiotic resistance. Gut 2010;59:1143-53. Okada M, Nishimura H, Kawashima M, Okabe N, Maeda K, Seo M, et al. A new quadruple therapy for Helicobacter pylori: Influence of resistant strains on treatment outcome. Aliment Pharmacol Ther 1999;13:769-74. Wu DC, Hsu PI, Wu JY, Opekun AR, Kuo CH, Wu IC, et al. Sequential and concomitant therapy with four drugs is equally effective for eradication of H. pylori infection. Clin Gastroenterol Hepatol 2010;8:36-41.e1. Das R, Sureshkumar S, Sreenath GS, Kate V. Sequential versus concomitant therapy for eradication of Helicobacter pylori in patients with perforated duodenal ulcer: A randomized trial. Saudi J Gastroenterol 2016;22:309-15. Zullo A, Francesco V, Hassan C, Panella C, Morini S, Ierardi E. Second-line treatment for Helicobacter pylori eradication after sequential therapy failure: A pilot study. Therapy 2006;3:251-4. Saad RJ, Schoenfeld P, Kim HM, Chey WD. Levofloxacin-based triple therapy versus bismuth-based quadruple therapy for persistent Helicobacter pylori infection: A meta-analysis. Am J Gastroenterol 2006;101:488-96. Gisbert JP, Morena F. Systematic review and meta-analysis: Levofloxacin-based rescue regimens after Helicobacter pylori treatment failure. Aliment Pharmacol Ther 2006;23:35-44. Gisbert JP, Castro-Fernández M, Bermejo F, Pérez-Aisa A, Ducons J, Fernández-Bermejo M, et al. Third-line rescue therapy with levofloxacin after two H. pylori treatment failures. Am J Gastroenterol 2006;101:243-7. Giannini EG, Bilardi C, Dulbecco P, Mamone M, Santi ML, Testa R, et al. A study of 4- and 7-day triple therapy with rabeprazole, high-dose levofloxacin and tinidazole rescue treatment for Helicobacter pylori eradication. Aliment Pharmacol Ther 2006;23:281-7. Best L, Cooper-Lesins G, Haldane D, Spenard J, Fallone C, Veldhuyzen van Zanten SJ. Helicobacter pylori antibiotic resistance in Canadian populations. Gastroenterology 2004;126:S1293, A189. Marzio L, Coraggio D, Capodicasa S, Grossi L, Cappello G. Role of the preliminary susceptibility testing for initial and after failed therapy of Helicobacter pylori infection with levofloxacin, amoxicillin, and esomeprazole. Helicobacter 2006;11:237-42. Miyachi H, Miki I, Aoyama N, Shirasaka D, Matsumoto Y, Toyoda M, et al. Primary levofloxacin resistance and gyrA/B mutations among Helicobacter pylori in Japan. Helicobacter 2006;11:243-9. Bogaerts P, Berhin C, Nizet H, Glupczynski Y. Prevalence and mechanisms of resistance to fluoroquinolones in Helicobacter pylori strains from patients living in Belgium. Helicobacter 2006;11:441-5. 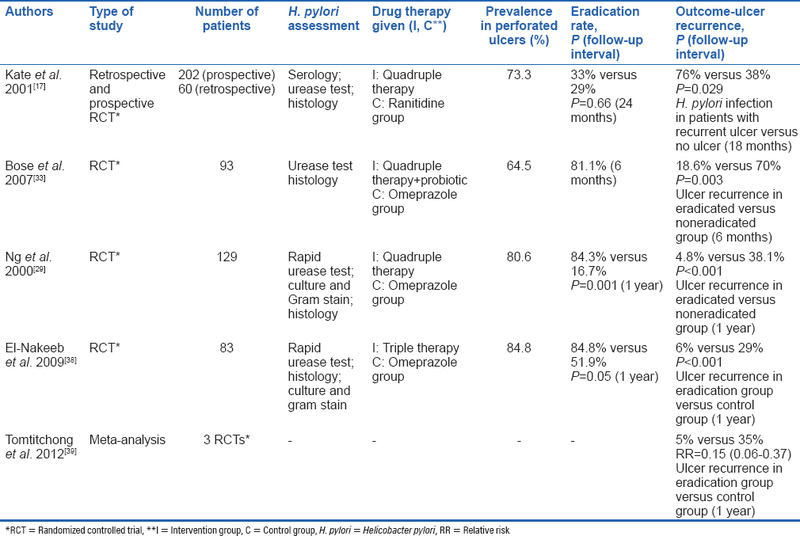 Sardarian H, Fakheri H, Hosseini V, Taghvaei T, Maleki I, Mokhtare M. Comparison of hybrid and sequential therapies for Helicobacter pylori eradication in Iran: A prospective randomized trial. Helicobacter 2013;18:129-34. Chen KY, Lin TJ, Lin CL, Lee HC, Wang CK, Wu DC. Hybrid vs. sequential therapy for eradication of Helicobacter pylori in Taiwan: A prospective randomized trial. World J Gastroenterol 2015;21:10435-42. De Francesco V, Hassan C, Ridola L, Giorgio F, Ierardi E, Zullo A. Sequential, concomitant and hybrid first-line therapies for Helicobacter pylori eradication: A prospective randomized study. J Med Microbiol 2014;63(Pt 5):748-52. Oh DH, Lee DH, Kang KK, Park YS, Shin CM, Kim N, et al. Efficacy of hybrid therapy as first-line regimen for Helicobacter pylori infection compared with sequential therapy. J Gastroenterol Hepatol 2014;29:1171-6. Sahoo AK. Hybrid Therapy Versus Sequential Therapy for Eradication of Helicobacter pylori – A Randomized Controlled Trial. Dissertation. Jawaharlal Institute of Postgraduate Medical Education and Research, Pondicherry, India; 2016. Hsu PI, Graham DY. Hybrid therapy versus sequential therapy for eradication of Helicobacter pylori – A meta-analysis. Gastroenterology 2015;148:420. Perri F, Festa V, Clemente R, Villani MR, Quitadamo M, Caruso N, et al. Randomized study of two “rescue” therapies for Helicobacter pylori-infected patients after failure of standard triple therapies. Am J Gastroenterol 2001;96:58-62. Bock H, Koop H, Lehn N, Heep M. Rifabutin-based triple therapy after failure of Helicobacter pylori eradication treatment: Preliminary experience. J Clin Gastroenterol 2000;31:222-5. Wong WM, Gu Q, Lam SK, Fung FM, Lai KC, Hu WH, et al. Randomized controlled study of rabeprazole, levofloxacin and rifabutin triple therapy vs. quadruple therapy as second-line treatment for Helicobacter pylori infection. Aliment Pharmacol Ther 2003;17:553-60. Miehlke S, Hansky K, Schneider-Brachert W, Kirsch C, Morgner A, Madisch A, et al. Randomized trial of rifabutin-based triple therapy and high-dose dual therapy for rescue treatment of Helicobacter pylori resistant to both metronidazole and clarithromycin. Aliment Pharmacol Ther 2006;24:395-403. Borody TJ, Pang G, Wettstein AR, Clancy R, Herdman K, Surace R, et al. Efficacy and safety of rifabutin-containing 'rescue therapy' for resistant Helicobacter pylori infection. Aliment Pharmacol Ther 2006;23:481-8. Apseloff G. Severe neutropenia among healthy volunteers given rifabutin in clinical trials. Clin Pharmacol Ther 2003;74:591-2. Bhagat N, Read RW, Rao NA, Smith RE, Chong LP. Rifabutin-associated hypopyon uveitis in human immunodeficiency virus-negative immunocompetent individuals. Ophthalmology 2001;108:750-2. Isakov V, Domareva I, Koudryavtseva L, Maev I, Ganskaya Z. Furazolidone-based triple 'rescue therapy' vs. quadruple 'rescue therapy' for the eradication of Helicobacter pylori resistant to metronidazole. Aliment Pharmacol Ther 2002;16:1277-82. Coelho LG, Moretzsohn LD, Vieira WL, Gallo MA, Passos MC, Cindr JM, et al. New once-daily, highly effective rescue triple therapy after multiple Helicobacter pylori treatment failures: A pilot study. Aliment Pharmacol Ther 2005;21:783-7. Wong WM, Wong BC, Lu H, Gu Q, Yin Y, Wang WH, et al. One-week omeprazole, furazolidone and amoxicillin rescue therapy after failure of Helicobacter pylori eradication with standard triple therapies. Aliment Pharmacol Ther 2002;16:793-8. Gisbert JP, Khorrami S, Carballo F, Calvet X, Gené E, Dominguez-Muñoz JE. H. pylori eradication therapy vs. antisecretory non-eradication therapy (with or without long-term maintenance antisecretory therapy) for the prevention of recurrent bleeding from peptic ulcer. Cochrane Database Syst Rev 2004;(2):CD004062. Gené E, Sanchez-Delgado J, Calvet X, Gisbert JP, Azagra R. What is the best strategy for diagnosis and treatment of Helicobacter pylori in the prevention of recurrent peptic ulcer bleeding? A cost-effectiveness analysis. Value Health 2009;12:759-62.